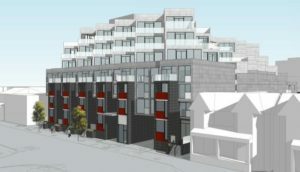 The developer Brock Seaforth Inc. of 57-65 Brock Avenue, is submitting a settlement proposal to Toronto City Council which will be considered on November 7, 2017. The settlement proposal makes revisions to the original application to amend both the Official Plan and the Zoning By-law to allow for a seven-storey residential building with two levels of above-ground parking located at the rear of 57 Brock Avenue. Details will be available at the community meeting. Councillor Perks, City Planner Kirk Hatcher and representatives from Brock Seaforth Inc. will be in attendance. If you are unable to attend the meeting and are interested in providing comment and/or receiving more detailed information speak to the planner directly, contact Kirk Hatcher, at (416) 392-0481 or Kirk.Hatcher@toronto.ca or email Councillor Gord Perks office at councillor_perks@toronto.ca.